So I don't really enjoy trick or treating (and am too old beside) and where I live is pretty far out of the way of those who do, but even so I've taken to dressing up every year with a cheap costume in some alter ego or another. Awhile back I dressed up as Bao-Dur. Last year I portrayed Naked Snake. 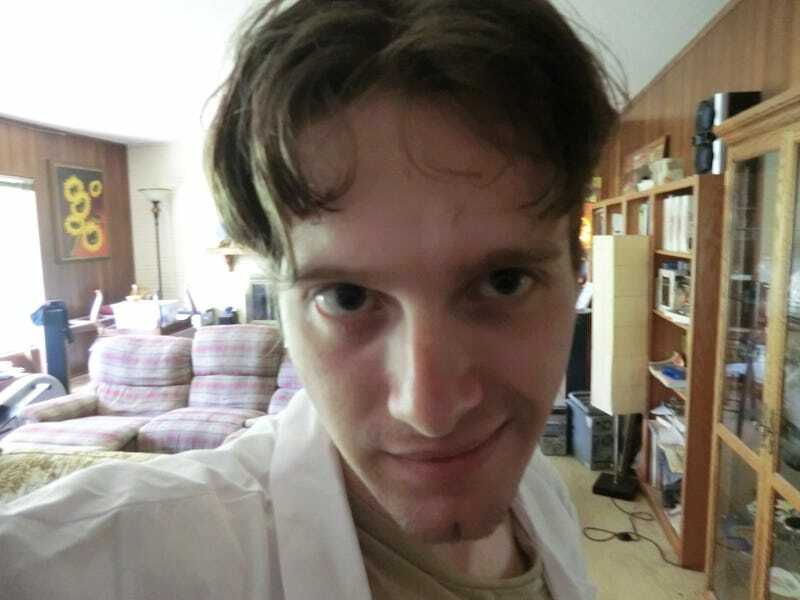 This year I was Okabe Rintarou. Or as he prefers to be known... Hououin Kyouma! Although the costume was cheap (essentially a lab coat and a Dr. Pepper bottle) I did nonetheless undergo a pretty heavy makeover. To anyone who is familiar with my physical personage, I tend to be very hairy - fully bearded and with long hair. All that was sheared for the costume, though a haircut's more or less par-for-the-course when I do this sort of thing. It's not a perfect match; my hair color, my eye color, not to mention my ethnicity are all wrong. But I aimed and I hope I hit somewhere near the mark.